The Alps contain a garden full of memories. Every shepherd, every pilgrim and every passer-by that once walked these mountains left his or her story behind in the valley, in the meadow or in the cliff, only to be replenished by the next passer-by. On a spring day in late April, Toni and I went to the Oberalpstock to plant our memories. Toni and Kelken on the ski lift to Piz Ault. 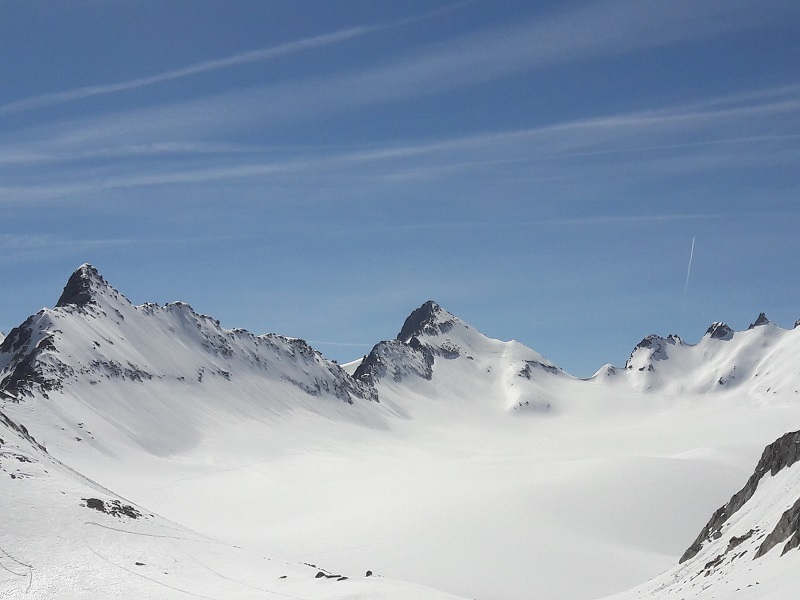 This has been an unusual year; the Alps have received an exceptional amount of snow late into April. 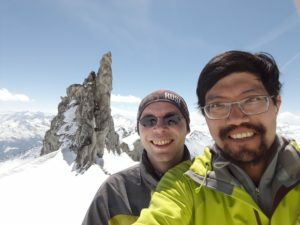 Toni and I decided to explore the Piz Ault – Cavardiras – Oberalpstock Triangle in the Glarus Alps, between the cantons of Graubünden and Uri. The starting point for this two-day tour is the village of Disentis, where we would take the ski lift to the station below Piz Ault. 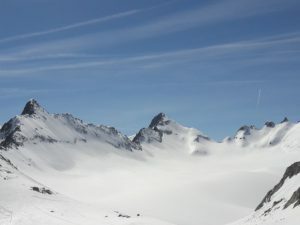 From here, the route follows the order: Piz Ault to Cavardiras on the first day, Cavardiras to Oberalpstock, followed by Oberalpstock back to Disentis on the second day. Toni on top of the iron rungs. The challenge of every tour begins with getting up in the early hours of the morning to catch the train. We started from Basel at 5 am, sat through the train ride with the anticipation of elementary school boys, and arrived in Disentis. From here, the ski lift brought us up to the station below Piz Ault. The lift was full, as we found out later that the ski pistes were still open for the season. Upon reaching the station on top, we unpacked the gear from our bag and put them on. A guy sitting on a bench next to us chatted with us. 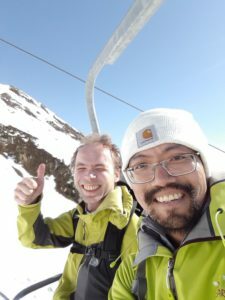 He lives in Heidelberg for the most part of the year, but spends every winter in Switzerland skiing. From him, we learned that the season in this part of the Alps would last until May. I looked at him with envy, and said that this was my first, as well as the last, ski tour of the season. After bidding each other a good trip, he went downhill and we went up. Toni walking in the Brunnifirn. Above us, the sun was radiating at full blast. The snow was as soft as marshmallow. We saw a couple ahead of us going in the direction that we were going, so we followed their trail to lessen our work. But it was still hard work to walk in this wet snow. The good thing about walking in wet snow is it is nice to fall, and this happened to me in the first hour of the tour. I was planting my right foot forward where it landed a bit too near the edge of the trail and I stepped into loose snow. I heard a click and my right ski slipped away from me. Common mistake number one: remember to lock your skis before walking! I glided down like a bum-rider to pick up my ski. Then walked up the 10 meters that I had lost. Thanks to the fall, my bum got a free massage. Arriving at the Cavardiras Hütte. 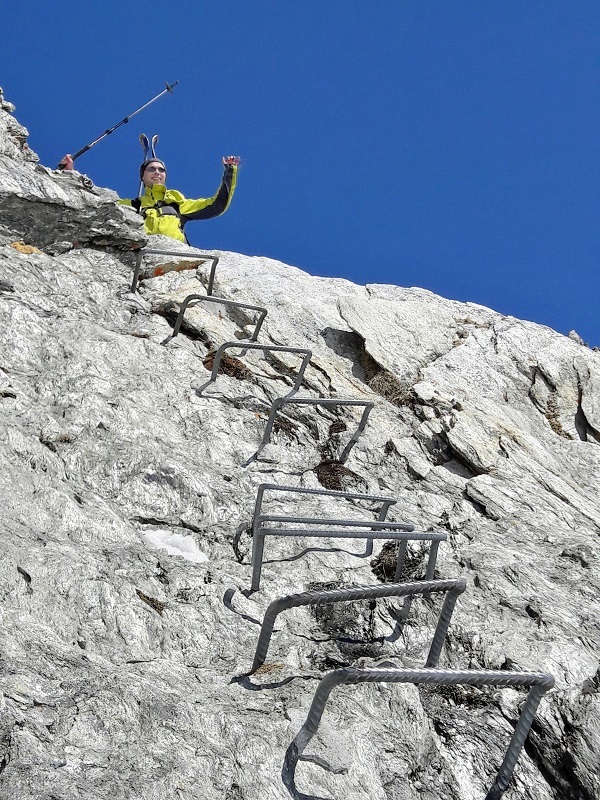 We walked 700 meters before coming to the iron rungs that Toni had been telling me about. I looked up at the vertical iron path and knew that this was going to be a character-building experience. We packed our skis and reached for the iron rung. We climbed up 2 meters of snow, which in the melting snow condition meant one step upward and half a step downward. We climbed with our hands and feet on the snow at the end because the slope was getting very steep. With one final stretch of the arm, we grabbed the first rung and it was a moment of relief. 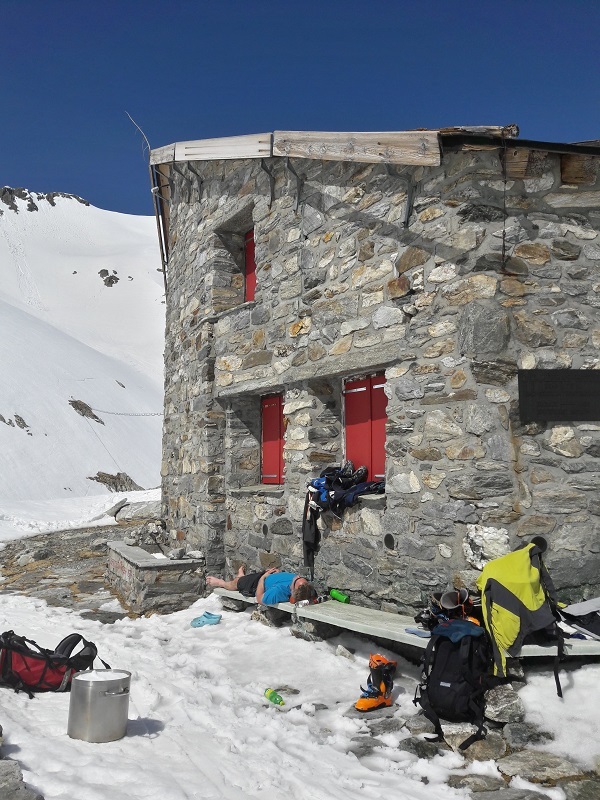 We crossed the ridge, put on our skis again and entered the snow field of the glacier Brunnifirn to get to the Camona da Cavardiras (Cavardiras Hütte). The distance to Cavardiras was 3 kilometers. As we skied down from the ridge, we saw the couple whose trail we had been following coming down from Oberalpstock and going in the direction of Cavardiras. They were amazingly fast! We were unenthusiastic about going uphill after crossing that treacherous ridge. We slowly came down the glacier for the next one and a half kilometers, then walked the remaining one and half kilometers to arrive at Cavardiras. A view of Val Cavardiras. We walked into the cute little Cavardiras Hütte. In the fireplace, wood was burning. On the stove, water was boiling. Out on a bench, two skiers were lying. We greeted each other. Toni and I unloaded our backpack. We went to the kitchen, got ourselves some beverages and drank it under the late afternoon sun. Beer always tastes better after a day out walking in the snow. Sipping the beer and basking in the afternoon sun, I fell asleep and dreamed that this was the most beautiful day in spring. I woke up hungry; it was dinner time. Toni just woke up from his nap too. We gathered in the kitchen and cooked a simple dinner: couscous with minestrone soup cooked in Alpine water that has been glazed by the sun, smoked in the crispy mountain air and seasoned in the meadow. In the middle of our dinner, another Swiss couple showed up. It must have been around 7 pm when they arrived. Thanks to the warm weather, they were soaked in sweat, their gear was wet from walking in the snow. But thank god, they made it just in time for dinner! After dinner, Toni and I sat around the kitchen table to review our plans for the next day. We recalled our walk today and thought that going back via the Brunnipass would be unfeasible because the valley has insufficient snow. The Val Cavardiras in the east seemed like a very long way down. 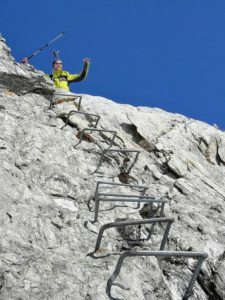 In the end, we decided to explore the neighborhood and go in the opposite direct of where we came from: a walk up to Oberalpstock in the morning and return to Piz Ault. We cleared the table and went upstairs to sleep. A panoramic view from Oberalpstock. We woke up to a brilliant day. We wanted to sleep more but the mountains were calling. We got up, ate a quick breakfast, left our mark in the House of Loo, packed our bags and off we went to the Oberalpstock. Toni and Kelken on Oberalpstock. The distance from Cavardiras to the Oberalpstock was 4 kilometers, so we knew that we would have to walk a lot today. The ski route is easily recognizable in the Brunnifirn. All we had to do was to plant our foot one after another. Eventually, we reached Oberalpstock. We ate some bread and cheese for lunch while taking in as much as possible the splendid view of the surrounding mountains. Row after row, pillar after pillar, the mountains looked like a dragon in deep sleep. We could sit here and admire the view forever, but we knew that we had to leave very soon. We skied southward from Oberalpstock to stay as high as possible on the slope, so that we could arrive not too far below the ridge where we came from. It was a fun ride down, but pretty torturous in the last 200 meters getting to the ridge. I thought, „The ridge, old friend, we meet again!“ If going up was a character-building experience, then going down was a training for Spartan warriors. For the last one meter of the climb, we could see where the trail begins. But there were no obvious way to get down. So with a leap of faith, we jumped and landed in waist-deep snow. Getting out of the snow after the jump was messy, but we knew that the toughest part was over. We walked about 300 meters and reached a flat spot where we could detach the skins from our skis. 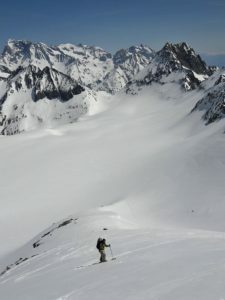 We skied down the groomed piste as long as we could, until the snow turned patchy and unskiable. We walked the last one kilometer in mud. The tour ended when we arrived in the valley. While sitting on the train back to Basel, I recall with delight that we have made it this far. 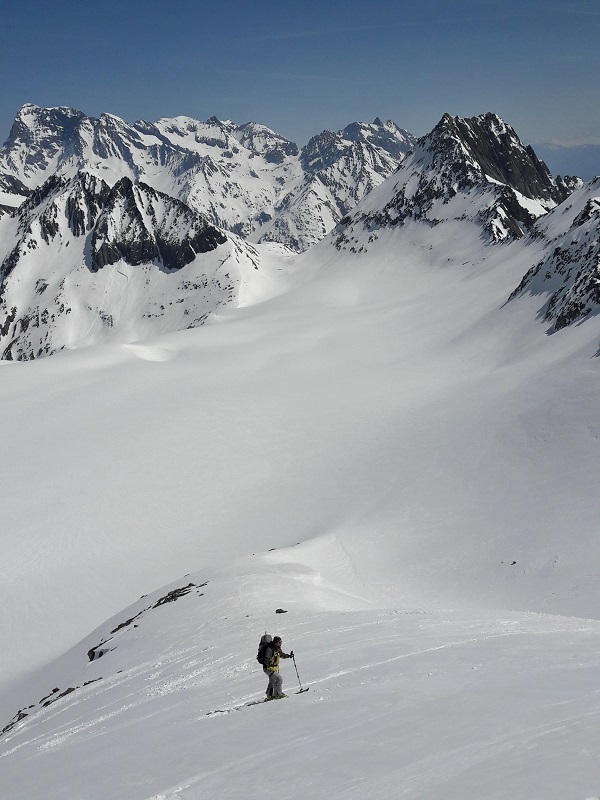 With our skis, we had carved our memories in to the mountains and valleys of the Alps. Maybe later, another passer-by may carve his or her own memory along the trails that we had left behind.